Mother Nature provides us excellent examples of weaker insects or animals using the art of disguise to shield themselves from predators. The katydid tries to look like a leaf, while the elephant hawkmoth caterpillar looks like a snake head. Both use deception to keep from becoming someone else’s lunch. 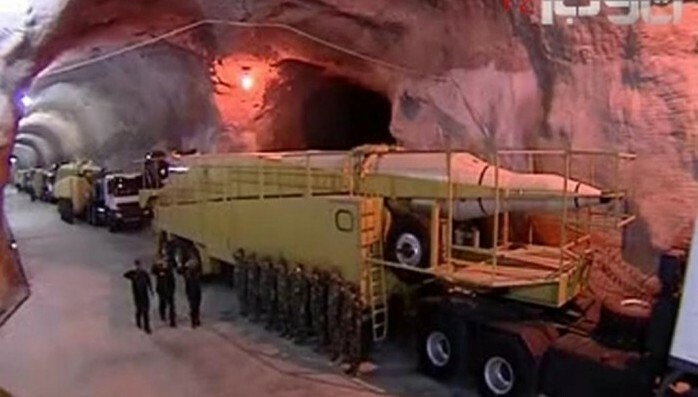 In a case of man imitating nature, the Iran regime’s Revolutionary Guard Corps released video footage of secret missile base in an underground tunnel deep in a mountain side. “The video, aired on semi-official Fars TV and set to rousing music, shows an extensive tunnel packed with medium- and long-range missiles and launcher units. The Guard said the missiles were on their launch pads, ready to be fired in the event of an attack on the country,” according to Fox News. The video of the missile base, so far unconfirmed by independent sources, follows the recent test firing of a new ballistic missile that the U.S. claims violates terms of a United Nations Security Council sanction prohibiting the regime from developing new missiles. The video’s airing raises some basic questions such as: Why? Dominic Waghorn, reporting for Sky News, said the video’s release was designed for domestic consumption as leaders within the Revolutionary Guards Corps worry about appearing weak to the rivals such as Saudi Arabia, especially at a time when its Syria campaign all but collapsed until the last-minute intervention by the Russians. But the Iran regime’s effort to project a more assertive posture as it has seen a rolling series of setbacks didn’t stop with the missile video and test launch. It included grainy video released through Twitter showing the regime’s Quds Force commander Qassem Soleimani, purportedly addressing Iranian and Syrian troops in Syria on the eve of launching a new offensive to attack rebel militias. Showing Soleimani taking direct command of ground forces following the deaths of two other senior IRGC commanders strongly shows the mullahs near-desperation to pull out a victory in Syria after so much blood and treasure has been spent with little to show for it as Assad’s forces have been pushed nearly all the way back to the sea. But with the looming deadline for certification by the International Atomic Energy Agency to complete its investigation of Iran’s past nuclear activities, the regime – which had been slow in responding to the inquiry – stepped up at the last minute to be responsive to the UN probe. In the past two weeks, after Iran had largely brushed off serious questions about its past nuclear activities, the IAEA and some Western governments directly warned Tehran that it must increase cooperation if it wanted IAEA board members to conclude it had sufficiently addressed their concerns, according to the Wall Street Journal. The board must decide in mid-December, based on a report by Director General Yukiya Amano, whether Tehran has done enough for the nuclear agreement it signed in July with six world powers to proceed. As the regime is confronted with the costs of a massive new offensive in Syria, it may very well have concluded that it needs the scheduled $150 billion in frozen assets as quickly as possible to replenish its coffers as part of the nuclear deal, as well as keep its economy afloat. That became painfully apparent as the engine from an Iranian Mahan Air 747 fell off shortly after takeoff from Tehran. The regime badly needs new aircraft to replace a fleet hampered by economic sanctions. Ultimately, many of the regime’s most recent moves can be seen as desperate acts by a leadership of mullahs being pressed in on all sides.